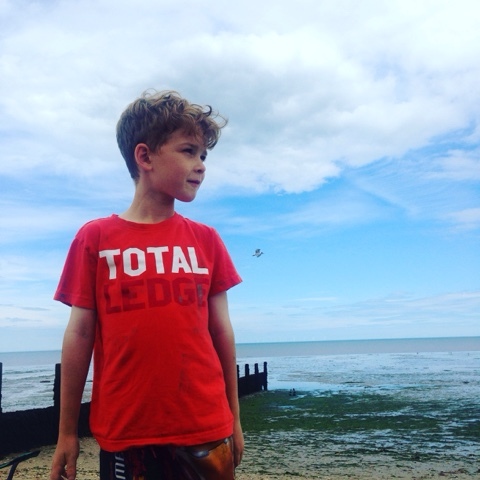 This weeks instalment was from our visit to the beach last Tuesday. My friend Jenny came down for the day with an awesome picnic. 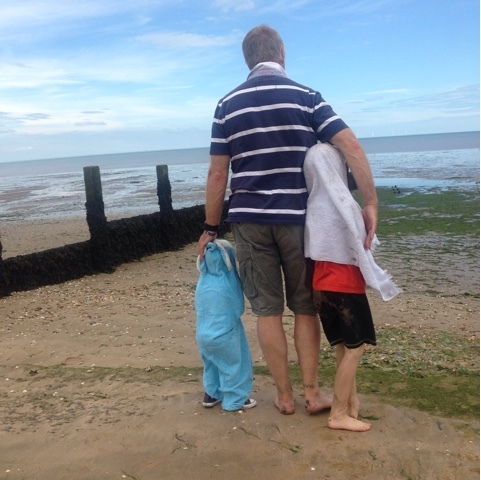 I packed up our beach bag full of beach essentials - buckets, spades, swimming cosies and blankets. We spent the whole day there, we made a sandcastle town and even went in for a swim. I decided out of all the pictures I took, this one of Oscar building the sandcastle a would be a great one to send to Jon's parents. Again it was super easy to make and Touchnote has just had an update so the app is now extra speedy! Single Postcards cost £2.99 (singe credit). 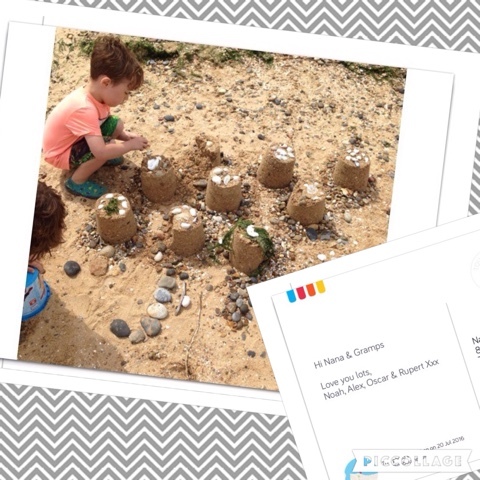 Buy a 5 credit bundle (5 Postcards) they cost just £1.99 each. Buy a 10 credit bundle (10 Postcards) cost is £1.80 each. Free worldwide delivery is included in every order." Bedtime with Rupert has become a massive power struggle. I decide it's bedtime and he decides its time for a picnic in the dark/hammering time/lining up his Tsum Tsum or his favourite running around in a circle in the dark. Once asleep and I've had a mini party on my own, he then wakes up at one for the rest of his all night party. We end up on the sofa watching some Disney film or another. Oh how I wish he would fall asleep as easily as he does during the day! At the weekend I decided I wanted to get my craft on with the boys, but seeing as Ru has decided sleep is no longer on his life agenda I didn't really want a craft that would take up too much of my concentration. I needed a craft that was going to be easy enough for me to do through my sleep deprivation. 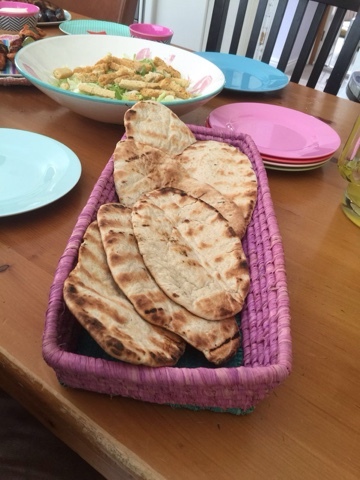 Pinterest came to my rescue, not only did I get the idea for the pasta necklaces, I've managed to put together a pin board for craft ideas to do with the boys throughout the summer holidays. 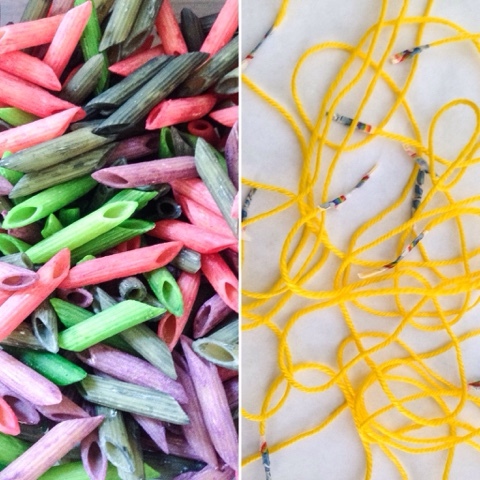 On Saturday just before dinner the boys all picked a food colouring and we set to work dying the pasta. 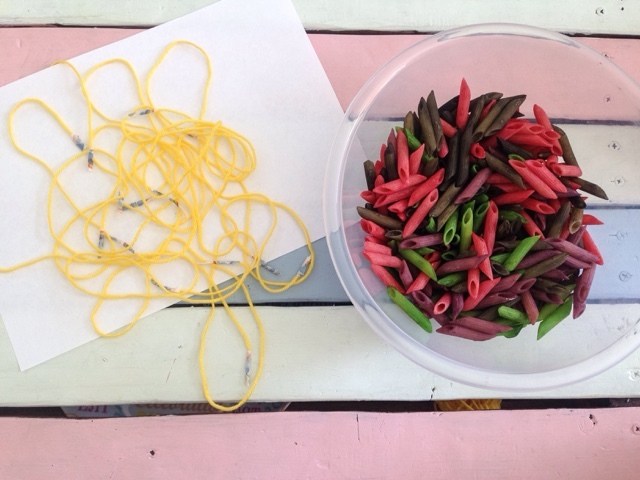 I used 4 plastic bag, two handfuls of pasta in each bag, 20-30 drops of food colouring and 1 tablespoon of white vinegar. 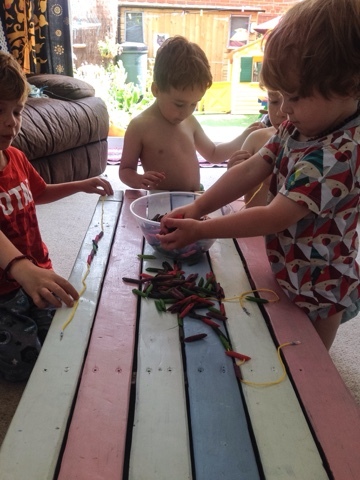 The boys all loved shaking up their pasta and watch it changing colour. We then left the bags for around 4 hours and before I went to bed, I placed the dyed pasta on a tea towel to dry out ready for the morning. 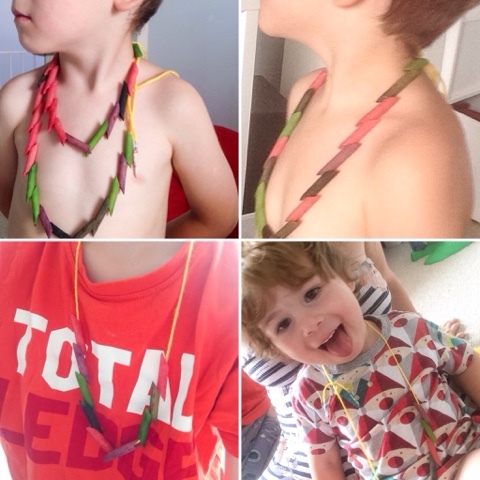 The boys and myself all had great fun making the necklaces. It was lovely just to switch off the TV and have the normal madness of the house turn calm. 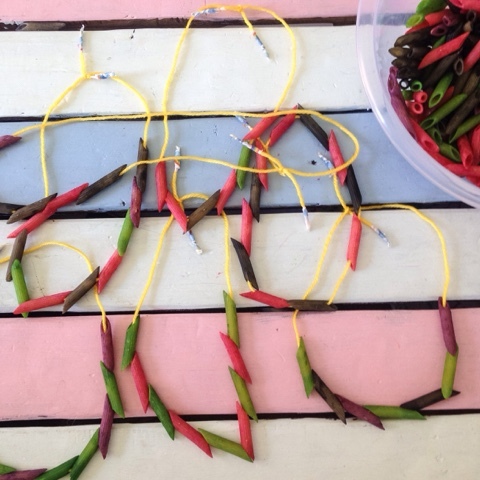 Ru decided playing with the pasta was more interesting than making a necklace, so we left him to it, whilst I made him one and then one for myself. Oscar made two for himself then decided he wanted to make one for our neighbours and auntie Jenni and cousin Sam. Alex then said he needed to make one for each of the grandparents. Even Mr I'm to cool to do anything but play on my PlayStation enjoyed himself! Next on our craft to do list is Papier-mâché Power Ranger masks. Whilst I was melting in the garden yesterday, I spotted this rather large and rather fluffy bumble bee. I keep seeing them in our lavender but every time I go to try and get a photo, they turn and fly off, or they so busy buzzing around that I can't quite get a decent snap. Our garden fence is covered in passion flowers and we always get an array of insects in there. 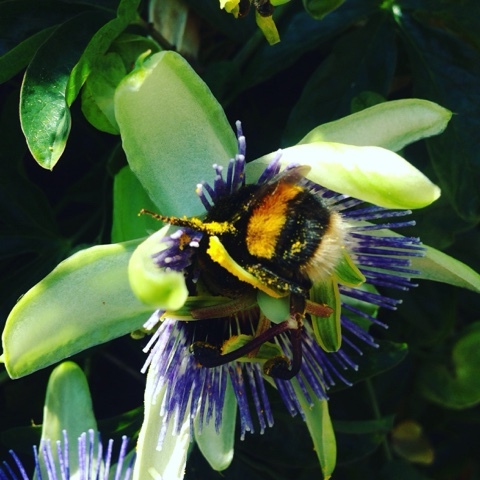 This bumble bee was covered from his nose to his tail in passion flower pollen. He was so busy working that he didn't even notice me and my phone get right up behind him and start snapping away. I love that you can see how fluffy he looks. He carried on in the same flower for the next couple of minutes. 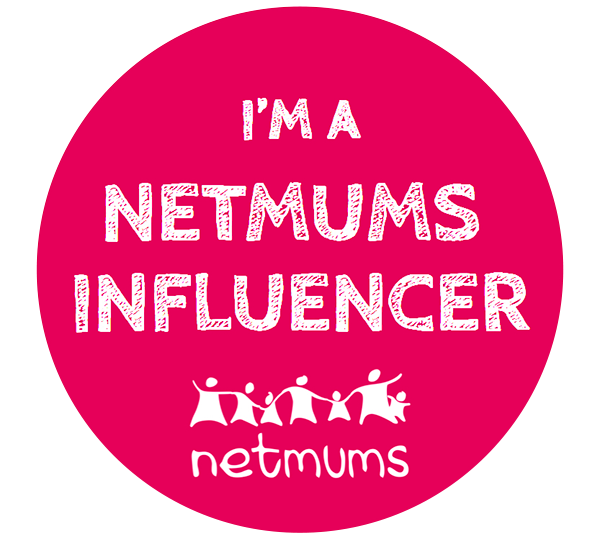 To celebrate the end of term I'm teaming up with Lalaloopsys™ for a fab giveaway!!! To be in with a chance of winning, head to the bottom and click on the Rafflecopter Widget! Collect the whole range to Style ‘N’ Swap across your favourite characters and create new and exciting looks for the Mini Lalaloopsys™ over and over again. All of your favourite characters – including Crumbs Sugar CookieTM, Mittens Fluff ‘N’ StuffTM, Peanut Big TopTM and Spot Splatter Splash – come in their own new Style ‘N’ Swap Assortment packs. Each set comes with one doll and over 10 removable pieces so you can change wigs, clothes and shoes for creative customisation and endless mix and match fun. 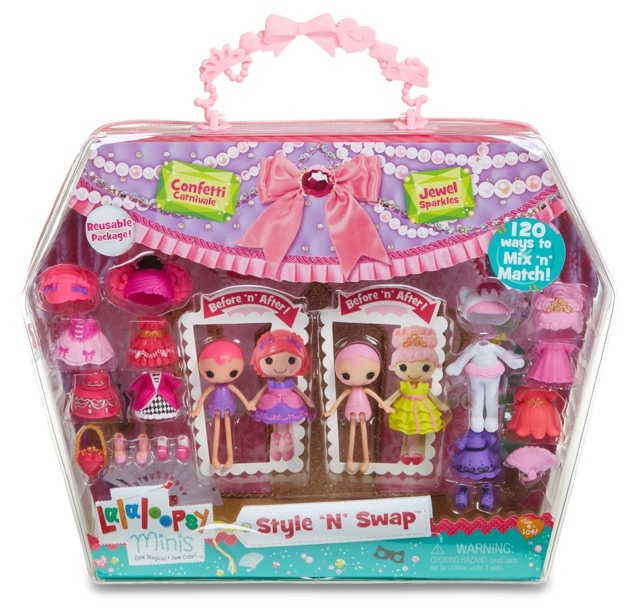 Each Style ‘N’ Swap Mini Lalaloopsy™ doll also comes with an adorable pet and fun accessory that fits their personality. • Crumbs Sugar Cookie™ has been baking all day! Now, it’s time to switch up her outfit in time for the tea party. Which dress will be the perfect ingredient for fun? • Mittens Fluff 'N' Stuff™ is going ice skating – the perfect reason to get dressed up in warm clothes! Sledging, skating or snowball fighting — it’s all great sweater weather fun! • Peanut Big Top™ is preparing for her next big show. When picking the perfect costume there is one must have — sleeves to hide tricks in! Ta-da! • Spot Splatter Splash™ was getting ready for bed when inspiration hit! Now her pyjamas are a work of art, too - no time to change when creativity takes charge. 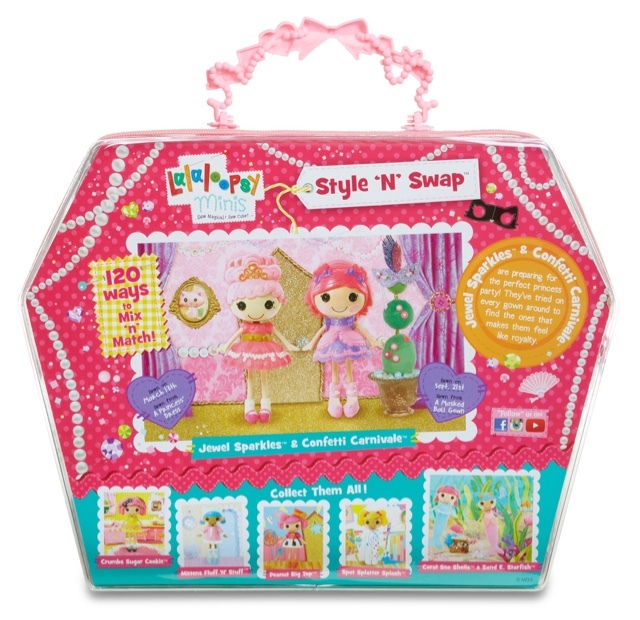 These sets each feature two dolls and 20 accessories for the ultimate mix & match fun! Jewel Sparkles™ & Confetti Carnivale™ are preparing for the perfect princess party! They’ve tried on every gown around to find the one that makes them feel like royalty. Coral Sea Shells™ & Sand E. Starfish™ are getting ready for a day at the beach! They’re still deciding whether to play in the sand or the water. Which outfit will you choose? Cherie Prim 'N' Proper™ has a motto — you must always look your best! That’s why the Lalaloopsy™ Salon is her favourite place to visit. Oh my, so many wigs and hairstyles to choose from! Suzette La Sweet™ is taking a break from lounging to stroll through the new boutique. Filled with fashion, choose from a range of wigs, clothes and shoes in this boutique playset. Mini LalaloopsyTM Cinder SlippersTM is sewexcited to have all her friends over to her new shop. Now she just has to decide between her two new dresses for the grand opening! This set is the perfect way to carry around all your Mini LalaloopsysTM on the go. With a signature handle for easy carrying, the Carry Around House zips open to reveal five different play areas for upto sixteen Mini LalaloopsysTM. It also includes an exclusive Mini LalaloopsyTM doll and a host of fashion accessories. 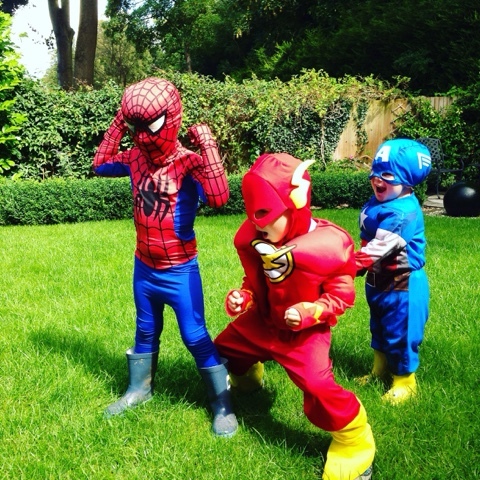 Mini LalaloopsyTM Style ‘N’ Swap is suitable for ages 4 to 104! Available from all good toy retailers. The giveaway will be for two weeks and will end on 6.08.16 midnight. The winners must respond within 28 days of the notification e-mail or a new winner will be redrawn. It is the responsibility of the company to dispatch the prize directly to the winner. I will however try to help with any issues you have! This weeks postcard was taken on Saturday when we headed to the beach with my parents for a last minute picnic. 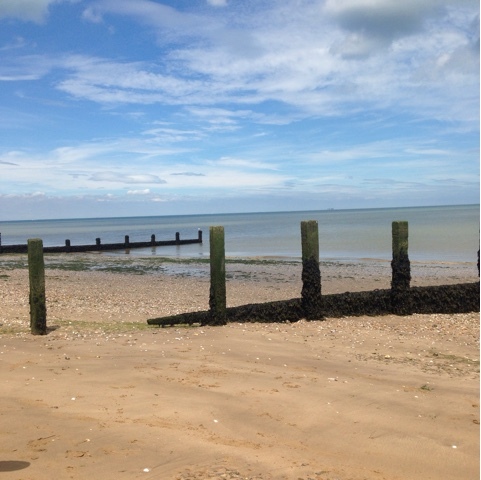 After we had chilled out on the beach front and the boys had, had their fill of running in and out of the water, we headed over to the shop to buy some ice creams. Afterwards they decided it would be a great idea to get my dad to chuck them around! Always wise after ice creams. As soon as I took this photo I knew it would make a great postcard and knew who would love it the most. 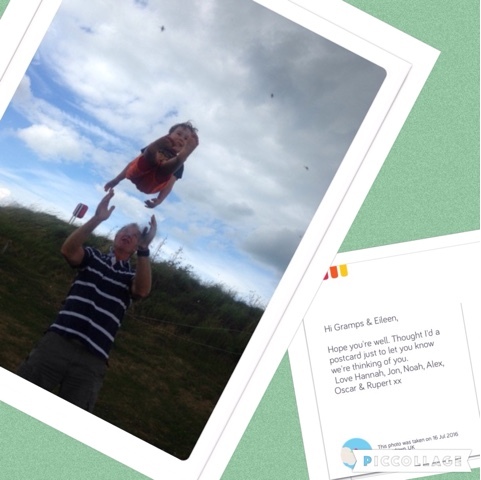 So whilst the boys were all playing I went onto my Touchnote app and quickly made up a postcard for my gramps - my dads dad. I knew he'd love the photo of his son and one of his great grandsons. I'm sure it will make their wall of fame. Not only are Touchnote postcards, postcards but they make beautiful photos as well. 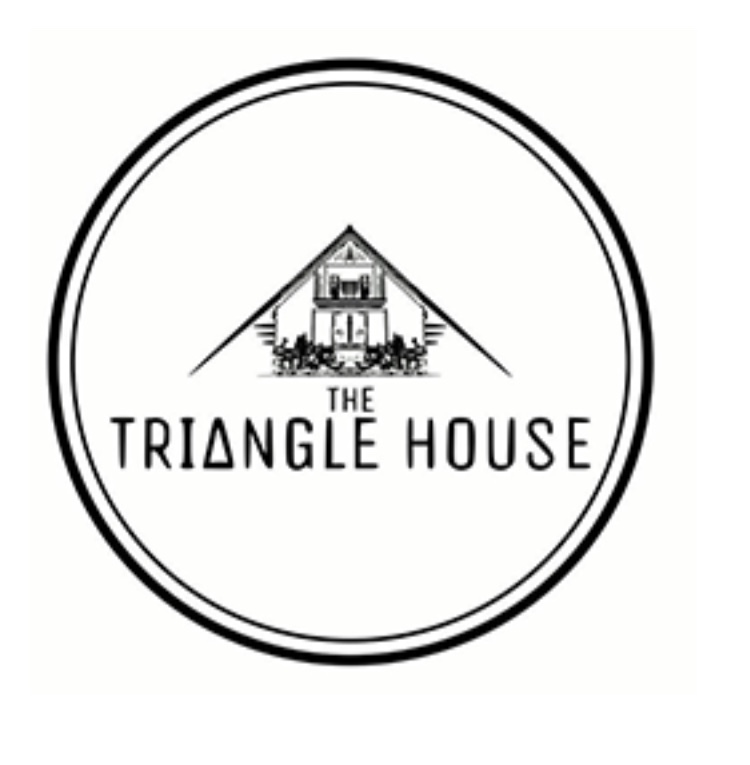 Have you tried the Touchnote app yet? Postcards from just £1.80 with free postage included. The more credits you buy the cheaper the postcard turns out. 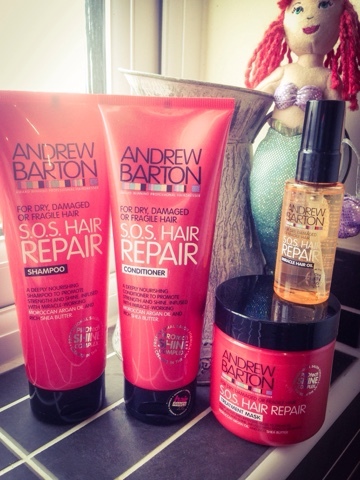 Shimmer & Shine With Andrew Barton's SOS Hair Repair! Andrew’s award-winning collection is uniquely formulated for dry, damaged or fragile hair. Infused with world-famous Moroccan Argan Oil and indulgent Shea Butter, the products are intensely nourishing to restore and treat your hair. Me and my hair have been having a love hate relationship since 2013. Before then it was long, luscious and black. 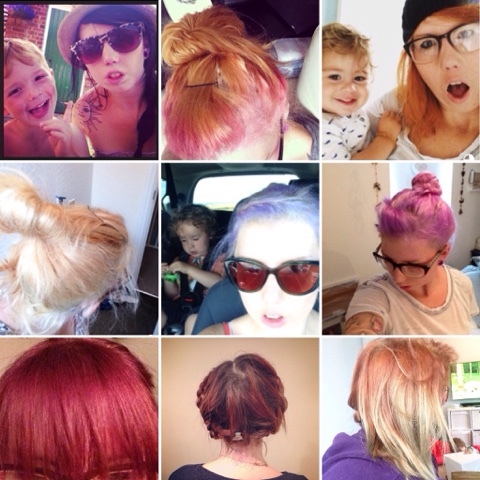 I had a bit of a identity crisis after an early miscarriage and decided I wanted to change myself complete and jump on board the bright pink hair craze. I bleached the hell out of my dyed black hair and the results weren't pretty but I finally achieved my pink hair goal. Only for that to last a couple of weeks, as I finally decided I looked more chavtastic that uber chic cool. Back to black I went. Over the next few years and much to the annoyance of my hair dresser / best friend Jenny I kept bleaching the hell out of my hair to change it to a silly shade before colouring it back to black. You would think being 30 I would know not to mess with my hair so much, even having it all chopped off because it was so damaged didn't stop me. Since buggering my hair up I'm always on the look out for shampoo that promises me the world and an instant fix. Just recently I decided I wanted to be blonde....because why not. It didn't work out and again my hair felt like chewing gum when wet. I walked around for a week or so with bright ginger hair before caving and going back to black. I was contacted by the guys over at Andrew Barton to see if I wanted to try some of their products. Always on the hunt for the next best thing for my poor hair, I said yep. I told them about my poor hair, and they instantly said the S.O.S Hair Repair would be the one to try. The oil has become my best friend and I use after every wash even if I'm not blow drying or straightening my hair. The shampoo & conditioner has given me an instant shine and my hair is back to feeling soft and lovely. I use the hair mask once a week, and I'll leave it on whilst I have a nice soak in the bath. Yes my hair is still damaged but it is well on its way back to looking and feeling healthier. I've made a promise to my hair that I will no longer mess with it and I will get it back to it previous glory. 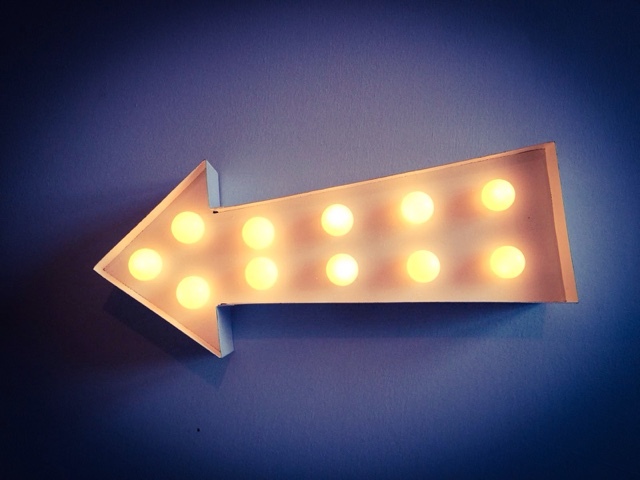 Things To Consider When Starting A Buisness. When Jon and I decided to start Island Homewares we had to really think about how we were going to store all the products we wanted to sell. We planned to have lots of different stock, and a good amount of the single items, so that we didn't have to keep on re-ordering them. We looked at our house and knew there was no room to store things in the house. Plus with a cat and dog in the house, I knew this was a no-no. People don't want brand new items with pet hairs or smells on them. 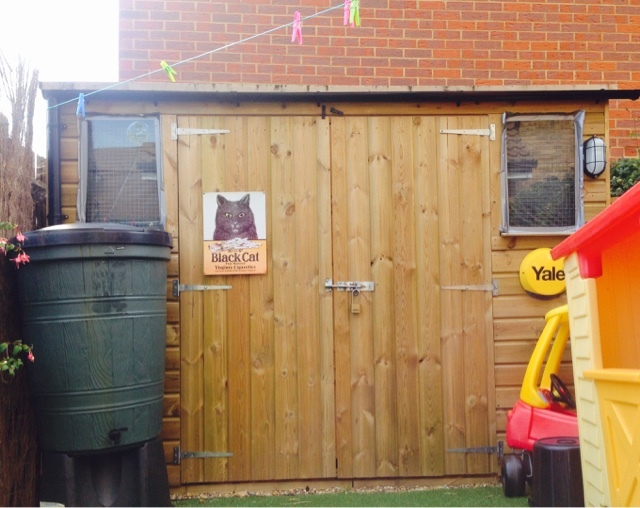 So we looked into building an office / store room in the garden. The shed was built with lots of shelving and a desk, so that Jon can wrap the parcels up. Back at Jon's parents, Jon turned half of the garage into an over flow storage. He insulated the walls, so nothing would be affected by the outside elements. Getting the storage right is key when starting a business. If your stock is not organised and tidy you wont be able to work efficiently. Which in the long run could lose you money. You need to be able to find the products that need sending off quickly and easily. Labelling up boxes and having them on show, helps. Not over stocking shelves with random boxes also helps. Another trick we have learnt is to keep things in different sections. 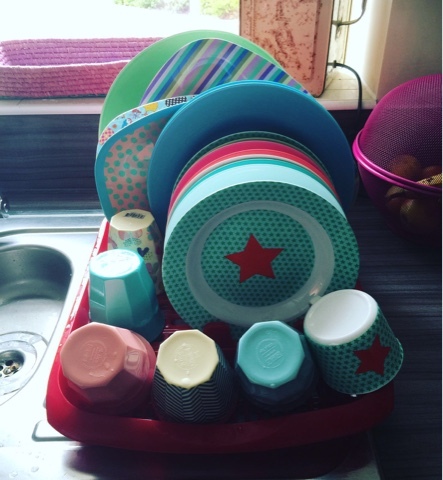 All our cups and mugs are on one shelf and plates are on another and so on. So when someone has ordered something we know which shelf that product is going to be on. If and when the business out grows our storage we will start to think of storing our products in a warehouse. Over at warehouse storage solutions. There many years of experience in the industry allows them to offer a full diagnostic check on your current storage situation and to find solutions. Warehouse Storage Solutions believe that Mezzanine floors could really be the key to successful storage solutions. If you have a business what are your top tips for solving storage problems? My parents joined us for a picnic on the beach. We knew the weather was going to be great, so Saturday morning I rang my mum and invited her down. The weather was so nice that the boys got their first dip in the sea this year. Last summer they were in the sea pretty much every other day. They are true beach bums at heart. We went to the part of the Island that we knew would be pretty much empty and we'd be able to have a whole section to ourselves. The beach didn't disappoint, no one was there and the boys could take their pick of what bit they wanted to explore without getting in other peoples way. Us adults set up camp on camping chairs and dug into our pretty poor mans picnic - sausages rolls and brioche with no filling. Sending Jon for picnic goodies was a bit of a fail, but none of the boys moaned. 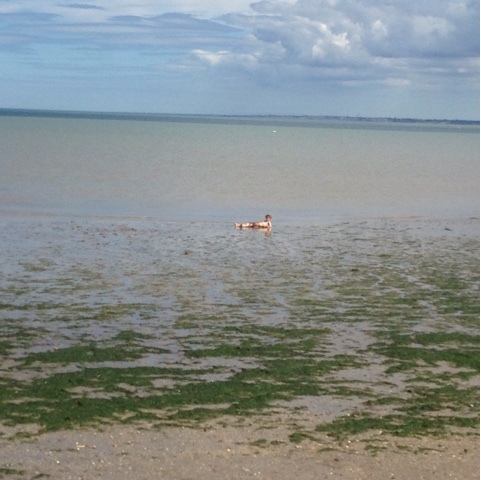 Myself and my mum joined the boys in the sea, but before we could blink the tide went out and it was a mission to get to the water. 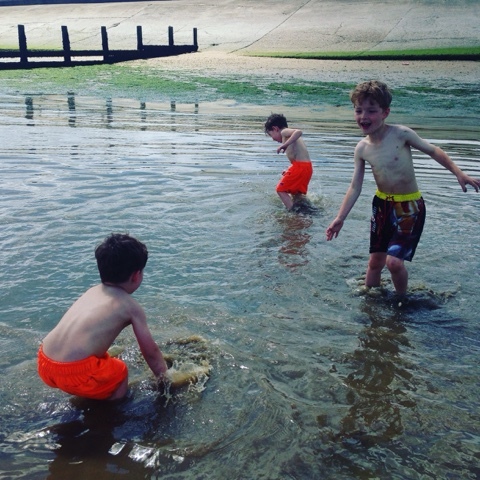 The boys loved having Mimi and Mergie there to watch them so off, then after we had, had our fill of the beach we packed up, put everything back into the cars and went to the car park ice cream shop, where we refreshed on yummy lollies. 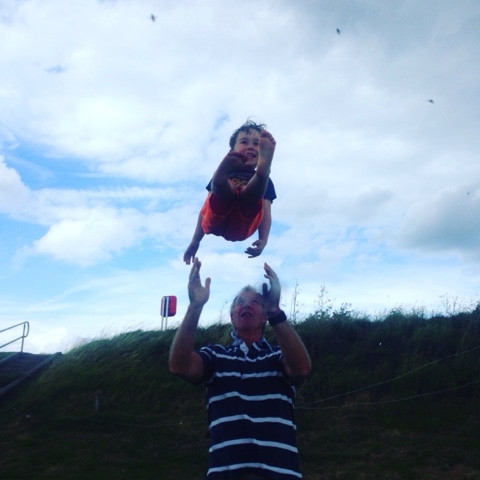 The boys also took this opportunity to get Mergie (my dad) to throw them around like rag dolls! The boys love it and were all lining up ready to have a go. 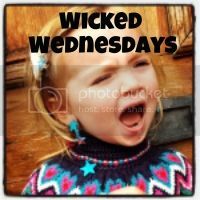 Is a day where we normally don't do anything, except do the house chores and get ready for the following week. 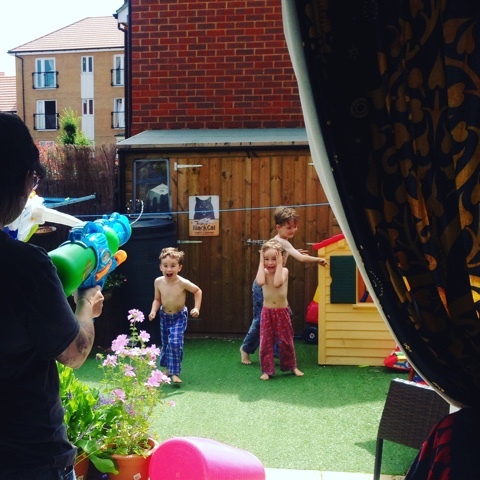 Jon decided to surprise the boys and buy them each a massive water gun, so they could have fun in the heat without getting hot. 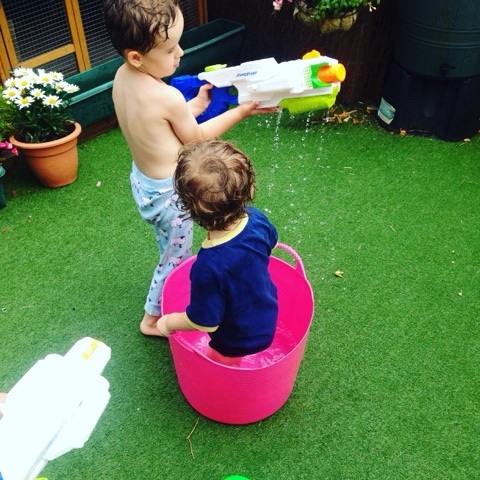 Safe to say they loved them, and we all had an awesome water fight. I think I was the overall winner. 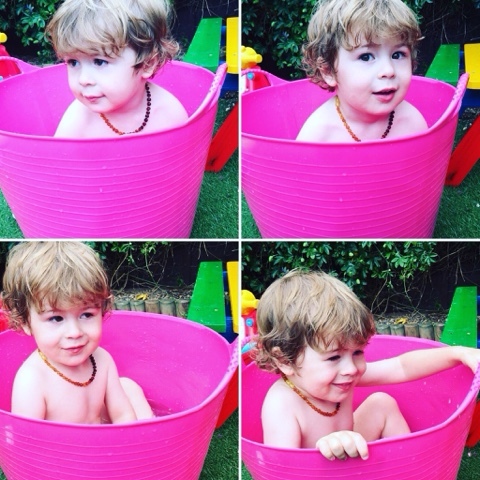 We wanted to keep yesterday fun as both Noah and the Twins are having settling in days at the new school. We knew it wouldn't be too much of an issue with the twins, but we were worried Noah may start to feel nervous and get upset about going somewhere new again. I'm loving these cool #ThisMamaDoes cards. In the afternoon I managed to get some me time in, as the twins decided to go and destroy their room, Noah was busy on his PlayStation and Ru was napping. 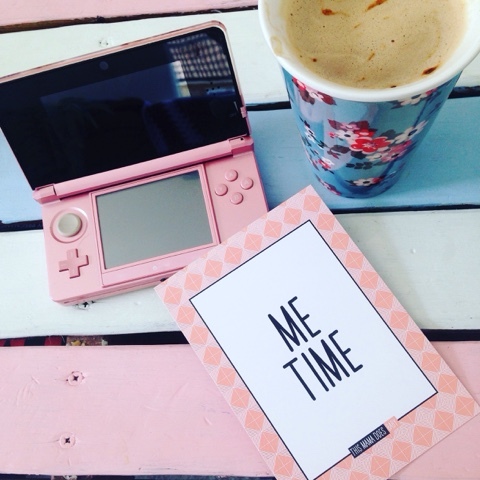 So I made myself a nice cup of coffee and cracked out my Nintendo DS so I could get some time on Pokémon. Noah is nearly ahead of me in the game and I don't feel too happy about that! Island Homewares has had some cool new stock arrive. 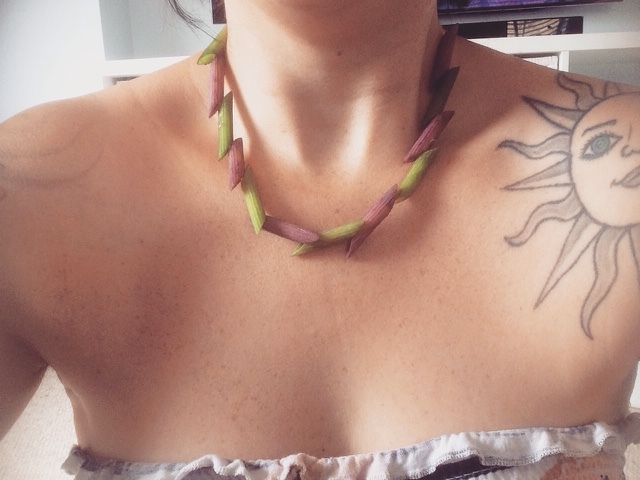 I'm going to show you a collection of my favourites! 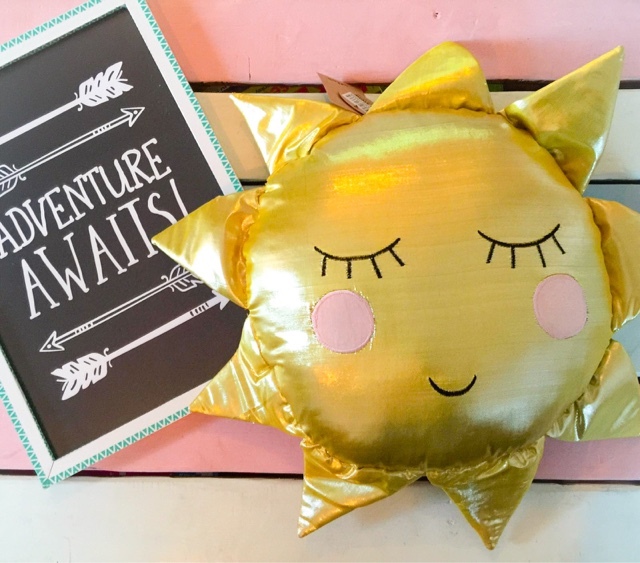 Starting off with this adorable Sass & Belle metallic gold sun. This pillow will go in any child's room, as soon as the boys saw him they all wanted one for themselves. 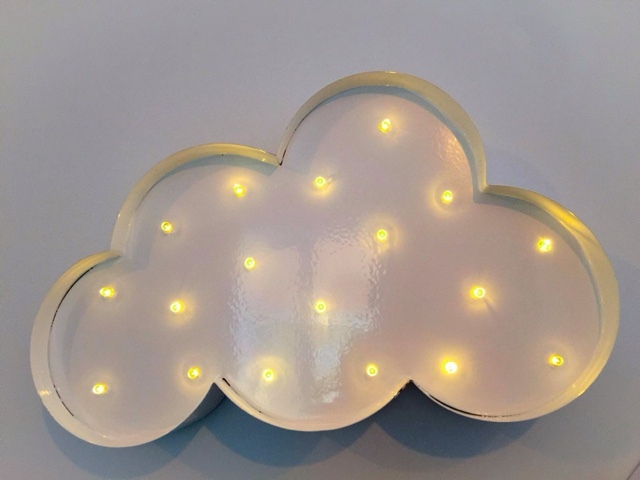 These cool LED lights are also from Sass & Belle, the cloud one has been restocked as it sold out in a matter of days last time. 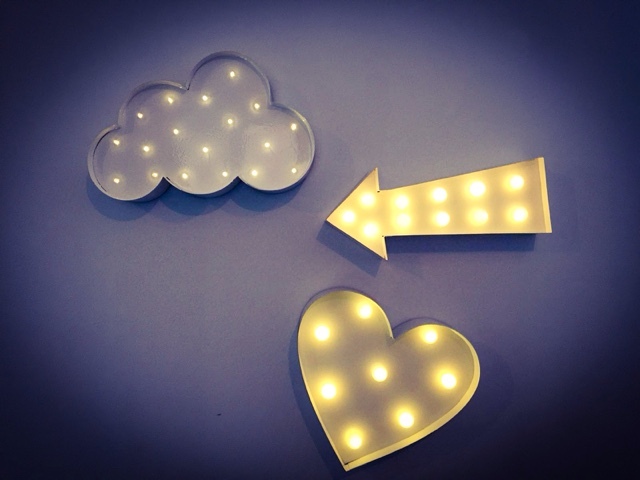 The hearts and arrows are brand new in the shop and we are hoping they fly out the windows the same way the clouds did. 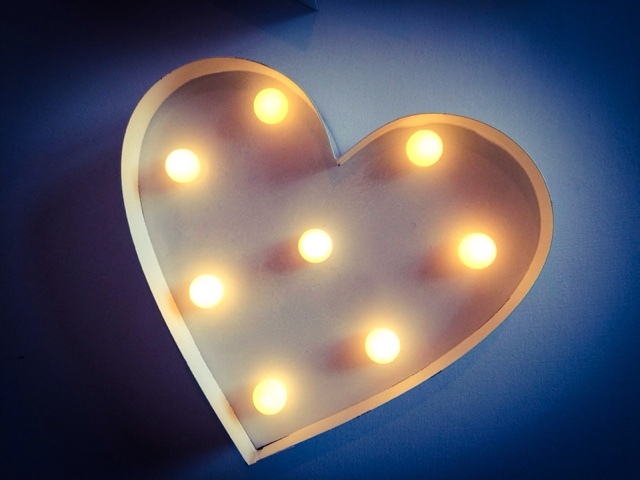 I'm going to get one of these for Ru's room as it will go nicely with his theme. I do love RiceDK kitchenware. It's fun, fresh and colourful. I'm slowly getting my way of having the kitchen filled with Rice gear. Not only is it funky, its child proof. The boys couldn't break it even if they tried. 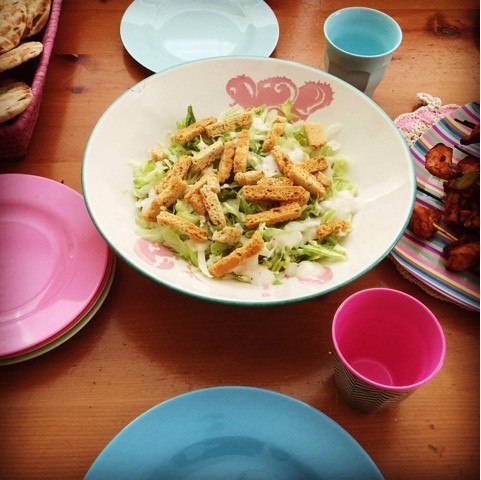 Their kitchen range has everything from cutlery to serving plates. Island Homewares has a whole section on the website dedicated to Rice. There's even a furniture range. Some stock seen in these photos, is yet to be loaded onto the site but keep an eye out as they will be up in the next few days! I wasn't ready for this AT ALL. I was quite happy to wait till Ru was at least a teenager before switching him from a cot to a bed. 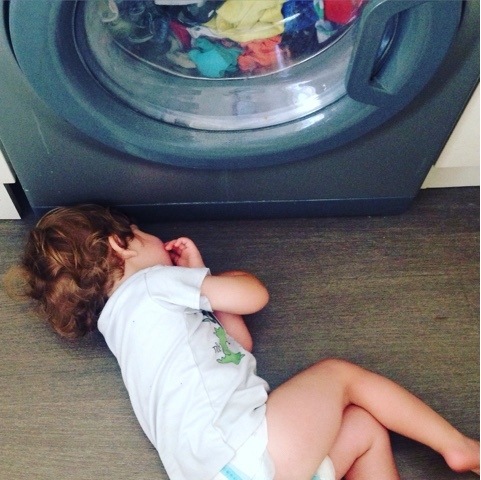 Transitioning from a cot to a bed is A BIG DEAL. My baby is no longer a baby!! My wild child had other plans about being stuck in his gorgeous white sleigh cot till his teen years. 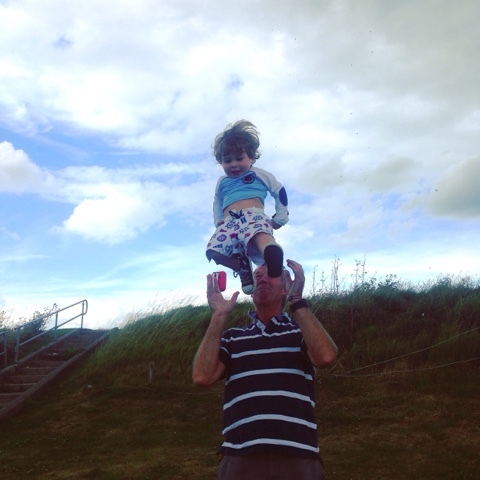 He learnt how to climb out of his cot and once that happened there was no stopping him. 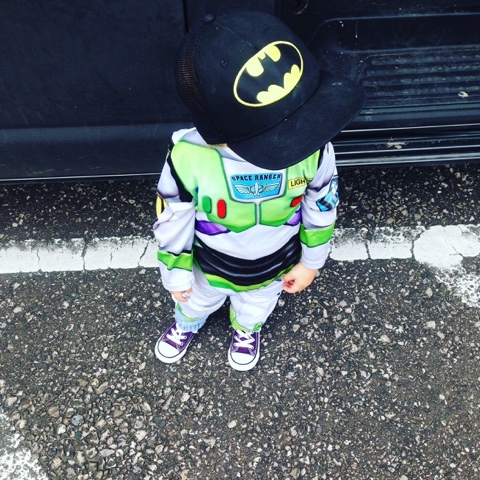 I found him in the middle of the night screaming in the corner of his room as he'd jumped out and banged his head. So the cot side had to come off, just for pure safety. We popped a baby gate on his room, so that he wouldn't be able to wonder around the house and get into mischief, if he did get out of bed in the dark. 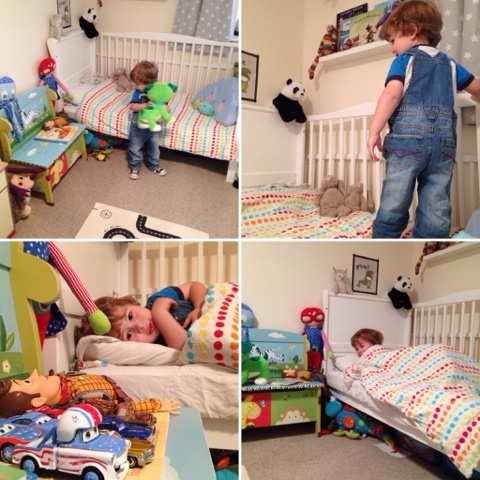 As well as changing his cot into a bed, I also had a change about of his room. I think it went down well and it makes his big room look even bigger. Ru seemed very impressed with his new big boy bedroom, I thought great bedtime should be a doodle. Oh how Ru laughed come bedtime. It was far to exciting jumping in and out of bed to actually settle down and go to sleep. I was in his room till 10pm! It is still a bit iffy come bedtime, but if I have worn him out enough before he goes to sleep we normally have no issue at all. My next hurdle was to stop him falling out once he was asleep, I had placed a rolled up towel at the edge of the mattress to try and help him stay in, but it didn't really do anything. I was then contacted by the lovely Victoria from Acosy Bumpers. 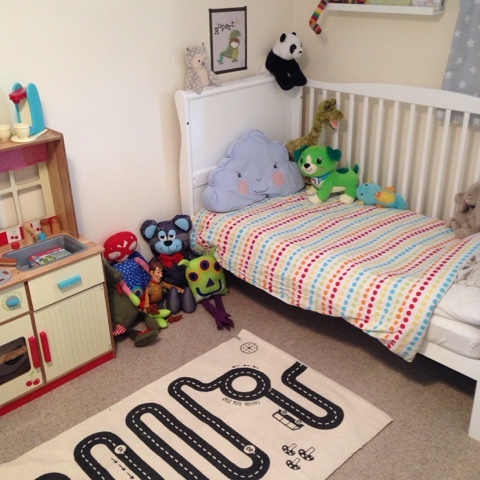 Acosy Bumpers are cot safe foam bed guard bumpers, designed to keep your child safe and reassured in their big bed. Our Bed Bumpers simply sit on the mattress edge and are secured in place by your fitted bottom sheet……….simple, light weight and very child friendly, creating safe sleeping solutions for you and your child. A safe alternative to the hard bed rails of past. 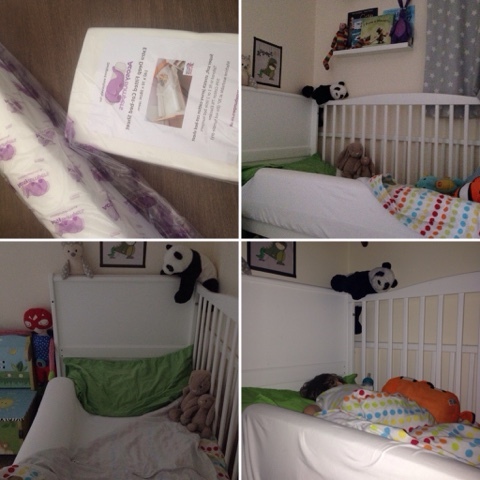 We were sent the Joey Pack, which is one little bed sized bumper and a extra deep cot-bed fitted sheet. This pack is currently being sold for £22.48. The delivery was fast, and it is no hassle to set up, unwrap the foam and place on the bed. The Acosy Bumper has been a bit of a life saver really. The first night he had his bumper on, he slept from 7.30pm to 6am! I peeked in on him when I was heading for bed and I watched him roll over and if the bumper hadn't been there, he would have rolled onto the floor and woken up to cause some drama. The Acosy bumper on its own without the extra deep sheet is only £9.99, which I really think is a great bargain, much cheaper than a lot of other bed guards on the market at the moment. If you needed two bumpers you can buy the Duckling Pack for £17.98. Acosy bumpers are not just for children, adults can benefit from them too. Designed to fit on any mattress including single, double, king & even electric/profiling beds under a fitted sheet. The bumpers prevent elderly or vulnerable adults from falling or rolling out of bed, they offer a discreet, soft but sturdy, versatile option to conventional metal/wooden bed rails. Ru is still loving getting up at stupid o'clock, but at least whilst he is asleep he is safe from falling out and bumping his head. For the next few weeks I'm going to be sharing weekly postcards from the beach. To show you how easy and fun it is to use Touchnote. I'll fill you in a little about the postcard service from Touchnote, so you can see what it's all about. "We all know sending a postcard from your holiday can be a hassle. Off we go down to the nearest souvenir shop to make our choice from the same small selection of generic out-dated images on offer to everyone else from the carousel or rack outside. We buy a stamp. We take it back to the room where it stays until we can finally drag the kids away from the pool for long enough to write it, usually to a chorus of “do I have to”s a day or two before you’re due to leave. Then we have to find somewhere to post it and of course it arrives home weeks after you do! The Touchnote app takes out all of the hassle. You can do it all straight from your phone or tablet without having to leave the sun lounger! In just a few clicks customers can choose their favourite photo, caption it, add a quick message, the recipients address, an emoji or two, there’s even a map location feature, and then tap to send. Cards are printed and received with free delivery worldwide in just days. Simple and fun to do. Special to receive. My first Touchnote postcard was to my parents after an afternoon spent at theirs. 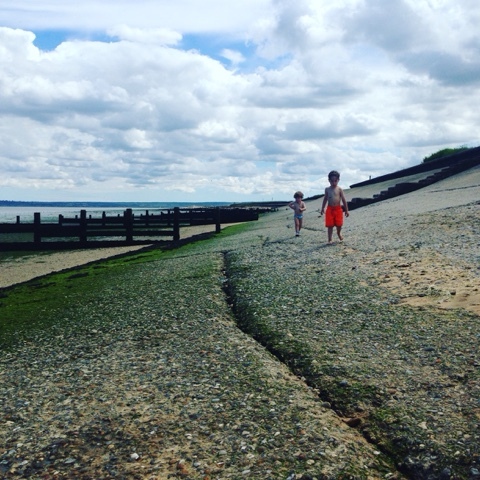 My little Ru throwing stones into the sea. 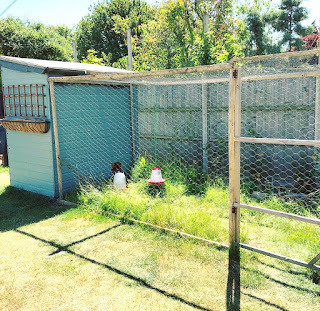 My parents loved having this wonderful surprise land on their doorstep and have asked for more surprises as it makes a nice change to the normal junk that lands on their mat. I love that it is soooo sooo sooooo easy to use. The app saves all the addresses you use and even if you have addresses stored on your phone it will be able to access them which helps make it even more easier for you to send a postcard at just a click of a button. 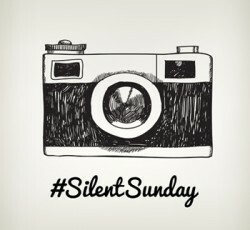 You can literally snap your picture, type out a quick message and its being sent off in a blink of an eye to make someone's day! The app is free and the postcards are cheap and 10x better than a shop bought card. 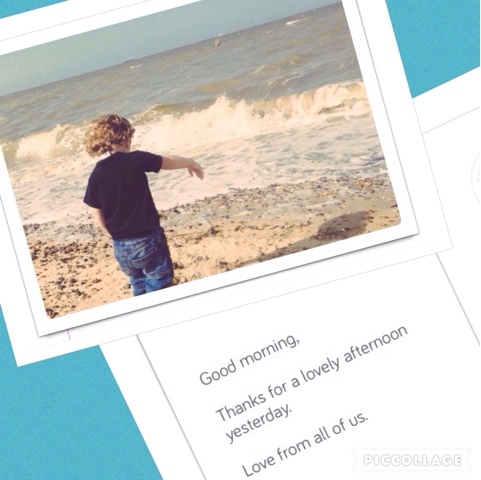 Why not make someone's day by sending them a personalised postcard from Touchnote. The postcards don't just have to be used when your on holiday, they can be used to just to show your thinking of someone. Now who doesn't love knowing someone is thinking about you?! See my next Postcard next Wednesday. If you've used the app already why not tell me in the comments below what you thought of it! !